Jockey Bryony Frost will miss next month's Grand National meeting after it emerged she broke her collarbone in a fall just four days after making history at the Cheltenham Festival. Frost, 23, became the first woman to ride a Grade One winner over jumps at the Festival when landing the Ryanair Chase. She was injured falling from Midnight Bliss at Southwell on Monday. The National meeting takes place at Aintree from 4-6 April. Frost's victory in the Ryanair Chase made the front page of The Times newspaper and she featured on BBC Radio 4's 'Woman's Hour' before racing on Monday. Frost had managed to walk back to the weighing room after the fall but a specialist diagnosed the injury on Wednesday. In a statement, Frost said she had been "taken aback" by the support she has received since her injury, and added: "Yesterday I went to see an extremely good specialist in Cardiff where my X-ray results have shown that I've fractured my clavicle. "I suffered a fracture previously which healed well under pressure. My body's response from that fracture makes me positive for when I go back for my assessment in a fortnight's time and a swift return." The Devon-born jockey came fifth in last year's National on Milansbar, who was the first British-trained finisher behind four Irish horses. Milansbar is not guaranteed to make the cut for the oversubscribed race, although Frost would have been a leading contender for any spare rides. Just before Cheltenham, Frost clocked up the 100th victory of her career, and she won praise for her bold front-running ride on Frodon, trained by Paul Nicholls, at the Festival. "I've probably watched the race 30 times at least since - I have to make sure it happened every time," she said in a BBC Sport column. "It's a memory you live for, and one you will look back on if there are darker days." A female jockey has never won the Grand National - with Katie Walsh coming closest when third on Seabass in 2012. Rachael Blackmore, who is second in the race to be Irish champion jockey, may have a ride this year on one of the horses owned by Michael O'Leary's Gigginstown House Stud. Blackmore rode a double at Cheltenham, while Lizzie Kelly was another victorious female rider. Talk about the ups and downs of life, particularly jump racing. 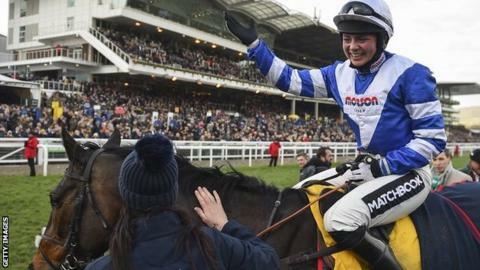 A week to the day after being feted across Cheltenham racecourse, and indeed the sporting world, after the historic success on Frodon, Bryony Frost is away from the saddle for a month or so. But my goodness the significance of what Frost achieved at Cheltenham is demonstrated by the amount of coverage this injury, pretty standard stuff for a jump jockey, has received. All that said, I don't imagine she'll be vanishing over the coming weeks - with so much spare time, and therefore availability, I can see the level of interest accelerating. Read more from Bryony Frost in her latest BBC Sport column as she describes the "perfect" race in the Ryanair Chase, not realising she had made history, the "cool" media coverage, celebrating at a service station and hopes for next year.